It is one of the most exciting pieces of news today...Apple is selling the iPhone 5 today, with the retinal display. The phone is expected to sell millions of units in a very short period of time. The retinal display is a high resolution display which allows sharper images and a wider range of color display as well. The effect should be stunning for all users of the phone, and patients with 'supervision from CustomVue LASIK may benefit even more. 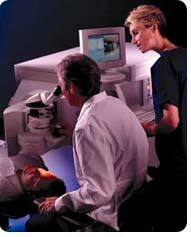 LASIK Detroit patients who receive the most advanced surgery should notice the most difference. LASIK Detroit performed on the VISX S4 platform provides full correction, beyond just the correction of nearsightedness, astigmatism and farsightedness. It can correct other problems that can cause glare and halos, and can decrease contrast sensitivity. For instance, a common problem called 'coma' causes smearing of the vision due to light distortion as it passes through the layers of the eye. Using CustomVue can reduce or eliminate this problem, leading to even sharper vision. In this way, glare, halos and night vision problems are minimized. The best combination for patients is bladeless LASIK aka All-Laser LASIK, with Customvue technology. This allows the sharpest vision, highest contrast, and thus the most appreciation of the new retinal display on the iPhone 5. Contact Dr. Goldstein to make an appointment today! !